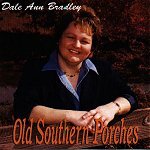 Sweet bluegrass from the beautiful voice of Dale Ann Bradley is what you'll find on OLD SOUTHERN PORCHES. The instrumentation is often delicate, sometimes slippery, and always as fresh as the morning air. On top of it all sits Dale Ann's voice, the sunshine behind all the warm notes you'll find on this album. Starting off with "Reason Enough," Dale Ann sets one foot forward and leads the dance as you whirl around and move your body to every flicker of a note. The song seems mellow, as she showers you with gentle gusts of wind, but the stutter of the banjo tingles with excitement, keeping you dancing as you enjoy every note. There is plenty of time to sit back, relax, and enjoy the slow beauty of life, as is proven on "A Face on a Poster." Instead of dancing, you'll be sitting back with on the porch starring at the sun, watching the leaves fall off the trees and the afternoon sky glowing in your face. Then there is the stomp of "Rain on the Roof," which will get you off your behind and up and shaking it once again. "Meghan's Smile" and the title track allow Dale Ann to show her vocal range and beautiful vocals chords once again, as her voice becomes the main instrument, played over the soft backing band, and calmly lets all her emotions run free. Of course, "Stuck in the Middle With You," a Stealers Wheel cover, ends the disc with some more burning dance grooves that will find you and make you want to just go crazy and dance. Definitely one of the finer voices in bluegrass, Dale Ann Bradley can keep you warm from start to finish whether she has you dancing or sitting back and falling into a comfortable sleep. I'll give this album a B+.